The idea is to ask the lender who is doing the foreclosure to produce the original mortgage note that you signed. The lender should have the original mortgage, but in many cases loans are bought and resold and bundled into securities and sold around so its possible they misplaced the actual note. If you simply ask them officially to produce the note then they may not have the note or at least could take some time to find it. If you're in foreclosure and want to try and keep the home or at least buy some time then this seems like a good strategy to look into. Here's a detailed how-to article from Consumer Warning Network explaining you can request a lender 'produce the note'. In The Foreclosure Crisis: Location, Location, Location fivecentnickel discusses how most foreclosures are in a few states. Shopping around is a great way to save money. But if we focus too much on the cost of an item then we may pay less to get a poor product. Saving money and getting a worse product may cost you more in the long run. So for this reason when I shop around I always try to get reviews on the products. 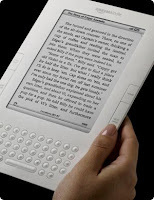 Epinions : The Epinions website is a database of reviews on products and services written by users like you and me. Its a good source of independent reviews on a variety of topics and more popular items can have hundreds of reviews. They also have reviews of many services and reviews for stores in general. Amazon.com: Amazon's website allows users to reviews products. There are usually a few reviews for most items. Even if I'm not buying at Amazon I still like to check out the reviews they have there. Of course Amazon is selling those items but you don't need to buy at Amazon to make good use of their reviews. Google searches: If I'm buying a product I'll do a Google search with the keyword of the product and 'review'. For example if I'm looking at cars I might search Google for "toyota camry review". Google can help you find reviews on more obscure products. You can also look to specialty sources for information. If you're buying a car then check out Edmunds.com for reviews. If you're buying a computer then look at PCMag.com. Information on local restaurants or services can be found on Yelp.com or Citysearch.com. If you're planning on traveling then Tripadvisor.com has a lot of hotel reviews. JD Power and associates has general satisfaction surveys on various categories and they are a good source of high level information on brands and companies. Thus far I've focused on online sources of information. You can also find information in your local library. Consumer Reports magazine is a good source of unbiased professional reviews of various products. I'd recommend their website but most of the content there seems to be exclusive to subscription members. There are a ton of sources for reviews on all sorts of products, services and companies. Whatever review source you use, just make sure that you do some research first before making a purchase to help ensure that you're getting a quality item or service. Bargaineering looks at How Accurate Are Credit Estimators? No, you should not buy credit card insurance. The other day I got a mailing from American Express offering to enroll me in a protection plan. I bet that the credit card companies are advertising these plans more and seeing more interest in them due to peoples fears about the economy. Of course they seem to push them normally as well. You've probably seen these ads with your monthly statements advertising these plans. The exact details of the plans all vary a little bit. Basically credit card insurance is a form of insurance offered by the credit card companies so that your credit card payments will be deferred if you suffer a job loss, illness or death. Basically they seem to just suspend interest and minimum payments. You still owe the balance of the debt in most cases. In the case of death they may pay off the balance up to a limit. The insurance is about 0.8 - 0.9% of your balance. The Amex cost was 85 cents per $100. My Citibank credit card offers such insurance. They say: "It's free for the first 30 days, then only $.85 per $100 on your New Balance each month." So if you have a $10,000 balance then thats $85 a month. My Discover Card offers their payment protection plan for "as little as 89¢ per $100." I have another card I don't use much and it offers the protection for 83 cents. The idea of insuring your credit cards seems like a good thing especially if you have a large payment that would be hard to handle in the case of job loss or illness. The cost of these plans offered by the credit card companies is not worth it. If you are unable to make payments then the worst the credit card companies can do is harass you for payment and then eventually discharge the debt which will hurt your credit. They will not take your home or otherwise be able to get settlement of the debt. If you pass away then your estate may owe the bill, but they can not go after your relatives to collect a debt. You don' have to worry about burdening your relatives with an obligation to pay credit card debt if you pass away. In general the worst thing that happens if you can't pay credit card bills is that your credit rating may get hurt some. But this is not life threatening and there are a lot of other higher priority things to insure first. If you're concerned about a job loss or medical issue that could keep you from paying your credit cards then I'd self insure and look for other forms of insurance. Instead of putting money into a credit card insurance program you could pay extra towards your credit card balance or set some money aside in your emergency fund. You can also make sure you are covered in the possibility of disability or death by having short term disability, long term disability and life insurance. Stay away from credit card protection insurance plans, their rates are too high and they are not a good deal. When you buy a car it will lose value over time. Most people know that a new car will lose a significant amount of its resale value the minute you drive it off the lot because it is now 'used' rather than 'new'. How much do cars depreciate and how can you figure the amount of depreciation? Cars will vary in depreciation rates depending on the brand and model. More attractive brands which are more dependable will depreciate less. So theres no one answer about depreciation rates but you could use average depreciation to get a ballpark idea. Roughly speaking you can assume a car will lose 20-30% of its value in the first year. In subsequent years it will lose 10-20% in later years. As a very rough guess on depreciation you could use 25% for year 1 and 15% for later years. Another way to estimate depreciation is to use a calculator. Here is a simple car depreciation calculator which will estimate rough amounts of deprecation at low, medium and high levels. Here's another car depreciation calculator. 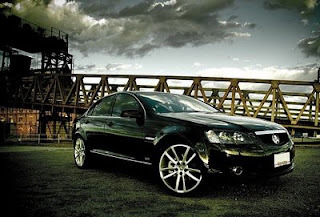 Each model of car will depreciate differently. If you currently have an older car then you can find out the estimated market value on the Edmunds.com site. Their True Market Value estimate is a realistic measure of what you can buy/sell a used car for. Or if you're looking to buy a new car you could look at the Total Cost of Ownership estimates. This will give you an idea of how the car will probably depreciate in the near future. For example you can look up the TCO for a 2008 Toyota Camry at the Edmunds site. In the table it shows the depreciation for years 1-5 as : $3763, $2237, $1969, $1746 and $1567 respectively. With a purchase cost of $21,130 that equates to 18%, 10.5%, 9%, 8%, 7%. In 5 years it depreciates $11,282 or 53%. Thats a relatively low depreciation rate. ON the other hand if you look at a 2008 Ford Focus with a cost of $12,067 the depreciation for years 1-5 is $4058, $1340, $1180, $1045, $938. That equals 33%, 11%, 9.8%, 8.6%, 7.7%. The total depreciation is $8,561 over 5 years for 71% total depreciation. As you can see the amount of depreciation differs a lot between those two 2008 model cars. Of course not every used car is the same. My Toyota has a lot of miles on it so the value is lower. My wife's car is in very good shape so its value may be higher than other cars of the same model. When you're looking at depreciation you should also consider the mileage on the car, the wear and tear and the kinds of options it has. Its a decent rule of thumb to assume cars will have about 12,000 miles per year. If the car has fewer miles it will be worth a bit more and higher mileage cars will be worth less. The used car appraisal that Edmunds does usually adds or subtracts 8¢ per mile so you could use that as a rough guide for the impact of mileage above or below 12,000 annually. Usually cars simply go down in value over time. However, classic cars can potentially appreciate in value. Once a car is 20-30 years old or so it may have value as a collector item. Of course not every 30 year old car is going to have appeal. If you have a 1964 Mustang then it will probably gradually appreciate in value. Classic cars may very well appreciate but in general but I would not count on any appreciation for a car unless you know it has good demand as a classic vehicle. Long Term Disability (LTD) insurance is insurance that will pay you a monthly benefit if you become disabled and are unable to work. Many employers offer this as a benefit. If you're lucky enough to have the employer pay for it then you are already covered. Some employers will offer it as an optional benefit with group rates that the employees can opt into. Other employers will not offer it as a benefit at all. If you can afford it then I'd recommend getting it. If you become disabled you may not be able to work. You'll not be able to contribute to the support of your family. So the chances of having a long term disability during your life time are not small. With the chances of being disabled 1/5 or 20% that is a little more likely than the chances of dying between the ages of 25 and 65. People consider life insurance mandatory but think LTD is optional, but its as likely or more likely that you'll be disabled than that you'll die. If you are already struggling to make your bills then I'd consider LTD more of an optional item. Pay up your emergency fund and pay off the credit cards first. Food, clothing, shelter all take top priority of course. I'd put medical insurance above LTD too. But once you get your basic bases covered then its time to make sure you're covered for things like life insurance or LTD. If you have any discretionary spending and have your finances under control then LTD is certainly something you should try and get. What if you're self employed or your employer doesn't offer it? If you are on your own and can't get a policy through work then you are faced with finding an individual LTD policy. Group policies are what you will get via your employer if they offer one. It seems that LTD is a lot easier to afford if you are in a group policy. 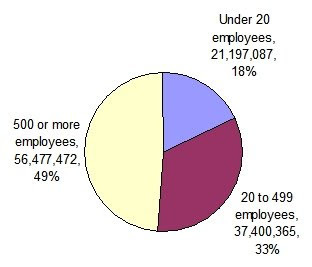 According to Insure.com the average group policy is $234 a year in 2007 and the typical individual policy is 5-10 times the cost of group rates. This makes it much more difficult to afford LTD if you're buying it on your own. Social Security Disability might help some. If you are paying into Social Security then you also receive the benefit of disability insurance. If you have a long term disability then you can apply for a disability. It can be difficult to get a disability approved by Social Security and the claims and approval process can take a long time. Backlogs for social security disability claims can be hundreds of days and nationally the average is over 1.5 years. If you are approved then the amount of the benefit will be a fraction of your current income. You can use the Social Security quick estimator to find out an estimate of the disability benefits. As an example I checked the benefits for a 35 year old making $40,000 and it was $1,310 a month or about 39% of their income, but it will vary depending on age and income. So I wouldn't count on social security to heavily. Getting a claim approved can take a long time and if you are approved the benefit is not extremely high. Did you know you could use an IRA to buy a rental property? You actually can. An IRA can be used to invest in many things besides the standard stocks and bonds. Usually brokerage companies only offer the typical mutual funds, individual stocks, bonds and CD forms of investment for IRAs. To invest in other things like private company ownership or real estate you will have to find an IRA management company that supports such investments. These are usually referred to as 'self directed IRAs'. One company that offers such self directed IRAs that can be used to buy real estate is PENSCO Trust company. I'm sure there are many others out there. PENSCO's site discusses the basics of investing in real estate with a self directed IRA. You can not buy property from a disqualified person, which generally means yourself and family members. You can not guarantee a loan yourself and any loan must be in the name of the IRA. This makes getting mortgages for real estate investments difficult. Some banks may offer such loans but they require higher down payments and this is probably going to fetch higher interest. If you do have leverage then you'll have to pay tax on the leveraged portion. To keep things easy you can buy real estate outright without a loan but that would require a pretty sizable initial IRA balance in order to afford a property 100%. Since self directed IRAs are not common there isn't a lot of information out there and not a lot of companies that offer it. It would be important to research the options extensively in advance so you fully understand how it works and you know what you're getting into. Be aware that fees could be relatively high. PENSCO's fees seem to run $375 annually and up. With that kind of fee schedule it would only be practical if you have a relatively high amount in the account. If you have under $15,000 then the $375 would account for over 2.5% fees. But if your balance is more like $200,000 then the fees would be well under 1% which is a decent rate compared to the expenses you might pay on a mutual fund. Using a self directed IRA to invest in real estate is a complex venture. This is not for the novice. Its probably not a good idea for most people to be frank. Note that I'm only touching on this topic briefly to give an overview of the topic. If you want to find out more then I'd recommend further research and consulting with a tax professional. A misstep with your IRA could cause you to pay taxes and fees for disqualified distributions. If you wish to invest in real estate via your retirement savings then also consider simply using a standard brokerage IRA account and buying individual REITs, ETFs or mutual funds that invest in real estate. This is a much more simple method of investing in real estate and would be much easier to diversify. You have probably seen commercials or otherwise heard about the Hyundai Assurance program. That is the name for the Hyundai program where they offer to buy back your car if you lose your job within the first year. Considering the number of new layoffs and the high unemployment this benefit should help a good number of people. It appears the program is helping Hyundai's sales. They saw their sales increase 14% in January when other car makers saw drops of 30-50%. The TV commercials don't give much detail on the program so I figured I'd check out all the fine print. Here is a brochure in PDF form. • Available on all new Hyundai vehicles. • Available to everyone regardless of age, health, or employment history. • 12 months complimentary on every new Hyundai vehicle financed or leased. Ok so right away there are a few specifics that limit the program. Its only for New cars so you can't get a used or certified car. You are covered for 12 months up to $7500 negative equity. The biggest detail here is that it is for a new vehicle that is financed or leased. Another detail in their explanation of how it works: "You must have made at least two scheduled payments and be current on your loan or lease in order to qualify for benefit approval." Given the information they have online about the program, this appears to be a legit deal without any major negative strings attached. They cover you for a 12 month period and buy back your car if you lose your job. The only strings I see are that the limit is $7500 and you have to make 2 payments first and it only last 12 months. None of these are major limitations to the deal. A possible hidden 'gotcha' is that the car has to be financed or leased from Hyundai. There are a couple reasons this might be bad. First if you get financing on a car from Hyundai then you don't get their rebate incentive. This is typical that a new car maker will offer $1000 cash back or X% financing. Its not both so you get to pick one or the other. If you finance a new Hyundai then you miss out on the cash rebate which could be $1000 to $2000 range. Second I don't see any specific interest rates advertised on the Hyundai site for most vehicles. The local Hyundai dealers also dont' have rates advertised. The incentive deals including financing at Hyundai only list interest for a couple models. Its possible Hyundai interest rates for some vehicles are above market rates that you could get at your bank or credit union. I don't think this is likely to be the case but you should make sure you check interest rates available at other sources to make sure that Hyundai's rates are competitive enough. A 1% interest rate on a $20,000 car could cost over $500 in extra interest over a 5 year loan. How exactly would this deal end up working? Here is an example of how it might function: Lets say I go buy a new 2009 Hyundai Sonata tomorrow. I end up paying $20,000. I get a 7.5% rate for 60 months and my payments are about $400 a month. Everything is fine for 6 months and I make my first 6 payments but then my employer unexpectedly goes bankrupt and I am unemployed. At this point the car is now only worth $15,000 due to the significant amount of deprecation new cars have during the first year. I still owe $18,319 on my loan. Since the car is worth less than I owe at this point I would have negative equity. In this case the negative equity would be the value of $15,000 less the loan balance $18,319 or 15000 - 18319 = $3,319. Normally if I couldn't make the payments and they had to reposes the car I'd end up with bad credit. But with the Hyundai Assurance program they'd take back the car and the assurance program would pay for the negative equity of $3,319 and you'd walk away without a negative impact to your credit. What is it really worth and how can Hyundai do this? Hyundai is actually contracting with a 3rd party named WalkAway to basically buy a form of insurance. Most most people will not lose their jobs in the next year. If someone does lose their job then the amount Hyundai might lose is roughly equal to the average 1st year depreciation less the payments already made to the loan. A rough guesstimation of the cost of this program: On average people will make 6 months payments which would equate to roughly 7.5% of the purchase price. So if the 1st year depreciation is 30% then they're roughly out 22.5% of the value of each car returned. But only maybe 5-10% of the buyers are likely to lose their jobs or other wise not be able to pay. So the cost premium here is in the ballpark of 1-2% of the vehicle purchase price. This is roughly equivalent to a $200 - $400 of insurance for a typical $20,000 car. Keep in mind this is a vary rough ballpark guess on my part. If you are going to buy a new car then the Hyundai Assurance program seems like a good deal. If you have specific reason to worry about losing your job then I'd generally recommend against running out and buying a new car. In any case I think buying a late model used car is your best deal in general. According to IRS publication 529 you can NOT deduct any of the items in the list below. There are some exceptions for these items but in general these items are not deductible from your taxes. See the full IRS document for the details. Broker's commissions that you paid in connection with your IRA or other investment property. Hobby losses—but see Hobby expenses, earlier. Illegal bribes and kickbacks—see Bribes and kickbacks in chapter 11 of Publication 535. Medical expenses as business expenses. he also has the rarely seen argument Timeshares Are Good Investments (a devil's advocate post). My How Much Should You Spend on on an Engagement Ring? article was featured in weeks Free Money Finance March Madness, Round 1, Posts 33-36 competition. I was in game #17 against the nicely written article 10 Things I Have Learned About Money. My Money Blog looks at the asset allocation of blended retirement funds with What’s Inside Your Target Date or LifeCycle Retirement Fund? Cash4Gold had a commercial during the super bowl. They seem to advertise a lot. The other day the TV happened to be on the Inside Edition program and they were doing a story on Cash4Gold. Here is an online version of the Inside Edition story on Cash4Gold. They had gold items professionally appraised at $975 to $1200. Then they got initial offers from local dealers of $1153, $1100, $676 & $700 but the dealers were willing to raise their offers if initially refused. Then they send the same gold to Cash4Gold and the offer is $209 and change. Cash4Gold offered 1/3 of what any of the local dealers did. After the offer was declined they doubled it. But that still comes in hundreds less than any of the local dealers. According to Inside Edition the Better Business Bureau has given Cash4Gold an 'F' rating. However, I was only able to find a BBB site with a C+ rating. p.s. Dear Cash4Gold marketing dept., I will take $100,000 worth of gold (by your measure) to remove this article entirely. 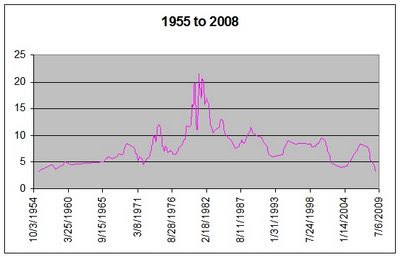 The Federal reserve has historical data on the bank prime rate going back to 1955. Investopedia defines the bank prime rate as "The interest rate that commercial banks charge their most credit-worthy customers. Generally a bank's best customers consist of large corporations." The prime rate is a fairly good indicator of interest rates in general. Often if you apply for a variable rate loan it will be based on the prime rate + X%. For example a home equity loan may be cited as prime + 0.74% if you have very good credit. From the data at the Fed site I made graphs of the historical rates over history. 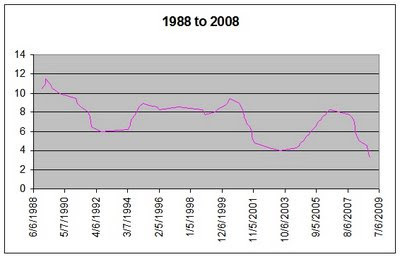 First lets look at the rates from 1955 to 2008. Yeah the rates hit 20% range in the 1980's. The maximum was 21.5% in December 1980. The average rate was about 10.1% and the median rate was 9%. The minimum rate was 3.25% recorded on Dec. 2008 as well as back in August 1955. In this period the average rate was 7.2%, the median was 7.5%, the maximum was 11.5% and the low was 3.25%. How much have our spending habits changed in the past 35 years? I decided to look back to 1970's and compare to this decade. I used consumer spending report for 1972-1973 and then compared that to consumer spending in 2005. 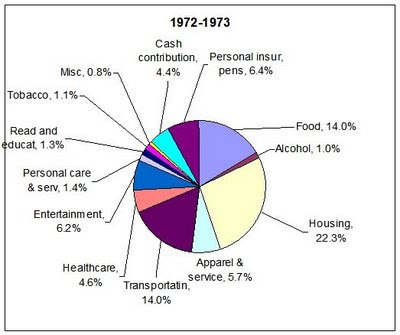 First of all lets look at the numbers and how much we spent in the '70's. Total average household income in the period was $11,419. In the table below I list the spending in major categories and the % of income that category represents. You'll likely notice that some of the % values have changed a fair amount. One major reason for decreases in many of these categories is that the average household had 3 people in the 70's and only 2.5 people in 2005. So while in the 70's you were buying food, clothing, entertainment,etc for 3 people in the 2000's you would only be buying those things for 2.5 people on average. Also, inflation has been low for many of these items. Food and apparel have not seen high inflation since the 1970's. Looking closer at food prices, they have not increased as fast as wages. If you look at the old statistical abstract and dig into the 1970's they have specific food prices listed, you can compare to the Food prices for 2006. So while wages increased +400% in the time period, most of these food prices increased +150-300%. Housing costs have increased as a direct reflection of housing expenses. Keep in mind though that size of the average home has increased over the decades. Personal insurance and pensions have gone up due to the decline in business pension funds. More people put money into 401k's and IRAs now compared to in the 70's when most employers had pension funds as part of compensation. Transportation as a % of income spending has not increased significant however the average household now has 2 cars whereas in the 70's there were only 1.25 cars per home. So while we're spending about the same on transportation as a % we're driving more cars. Interestingly we have not had a significant change in spending on healthcare as a % of income per household. This may be a reflection of fewer people in households and the fact that a larger % of Americans are uninsured. 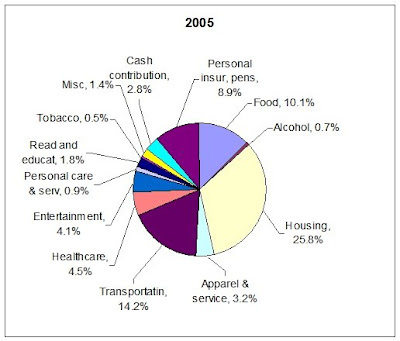 Spending on vices has decreased. IN the 70's we spent 2.1% of our income on alcohol and tobacco but by 2005 that had decreased to 1.2%. Part of that is decrease in the amount of smokers in the country. In the 60's and 70's about 40% of the adult population smoked but by 2006 the rate dropped to 20.6%. Also it appears that alcohol consumption has dropped about 10% from 1970 to 2006.